and the following is the details he has forward to me at this time. It has communicating sails that open and close to produce two shapes. One is a scoop and the other is a wing. The wing not only reduces drag in the advancing sail, but also contributes lift at higher wind speeds, and provides stability to the action. Two sail are open at a time. It starts pumping significant water at wind speeds as low as 3mph. The tower does not interfere with the rotor and can be made in large or small sizes depending on use. The entire unit is extremely light but very strong, withstanding excessive wind speeds. Winds of over 60mph has had no ill affect. The entire tower turns with the rotor. There are only two bearings in the unit.and the cost is lower than any known wind machine by several orders of magnitude. The unit in the picture(14' rotor,20' tower) weighs about 70 lbs. including the tower. One person can assemble and erect it in one afternoon. Putting it up, or taking it down requires less than two minutes. Appliances of all sorts can be attached to the belt drive at the base of the tower. 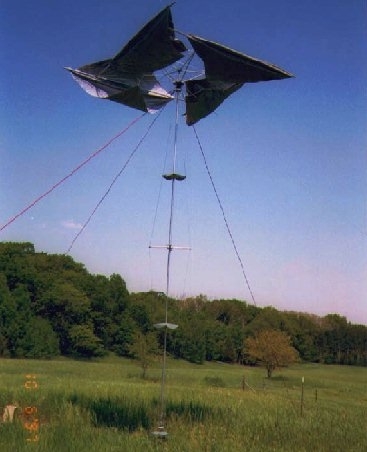 The unit is portable and is erected on stakes driven into the ground. No permanent base is required. A patent has been applied for by the way.